Kiefer Sutherland (born 21 December 1966) is a Canadian actor, producer, director, and singer-song writer. His full name is Kiefer William Frederick Dempsey George Rufus Sutherland. Kiefer portrayed Jack Bauer in the hugely popular drama series 24 (which aired 2001–2010, 2014). His performance on the show garnered an Emmy Award, a Golden Globe Award, two Screen Actors Guild Awards, and two Satellite Awards. Donald Sutherland is Kiefer Sutherland’s father, and actress Sarah Sutherland is his daughter – acting truly runs in the family. He has also starred as Martin Bohm in the Fox drama Touch, and lent his acting abilities as Big Boss and Venom Snake in the video games Metal Gear Solid V: Ground Zeroes and Metal Gear Solid V: The Phantom Pain. 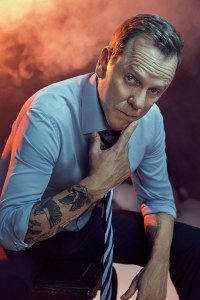 Fans have enjoyed Kiefer’s stellar performance as President Tom Kirkman in the ABC political drama series Designated Survivor (2016–2018). Kiefer got his first leading film role in the Canadian drama The Bay Boy (1984), which earned him a Genie Award nomination. Since then, Kiefer has entertained audiences the world over, starring in films such as Stand by Me (1986), The Lost Boys (1987), Young Guns (1988), Flatliners (1990), A Few Good Men (1992), The Three Musketeers (1993), A Time to Kill (1996), Dark City (1998), Phone Booth (2002), Melancholia (2011), Pompeii (2014), Forsaken (2016) and Flatliners (2017). Click to find out how many films Kiefer Sutherland has been in. Kiefer Sutherland has been inducted to the Hollywood Walk of Fame and to Canada’s Walk of Fame, and has received a Lifetime Achievement Award at the Zurich Film Festival. Recently performed 50 shows in 7 countries in less than 3 months during his 2018 Reckless tour. This covered North American and European tour. 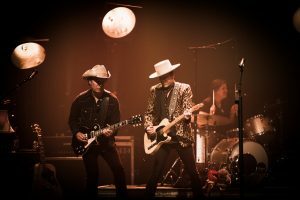 During his lengthy shows, he covers some of his favourite songs from Merle Haggard and Tom Petty. Displaying equal ease with both rock classics and country standards. Musically, his shows encompass country, rock, blues and Americana. Driven by his gritty vocals and anchored by his gift for telling compelling stories in his songwriting. Though Kiefer Sutherland loves writing and recording, the stage holds a special place in his heart. For the last three years, Kiefer toured extensively earning the acclaimed actor a reputation as a relentless road warrior. His primary motivation as an artist is the thrill of forging that connection with his audience through the music. “I couldn’t have imagined the depth with which I have fallen in love with touring. To have the opportunity to convey intimate, personal stories to an audience, for me, has proven to be priceless,” Kiefer said. You can connect with Kiefer by following him on Twitter, Facebook, Instagram. Subscribed to Kiefer’s YouTube channel to watch him in new videos published regularly.